Nolands Ferry boat ramp has access to the Potomac River off Md. Route 28 south of Frederick. There are 10 parking spaces and portable restrooms. Take Route 28 to Nolands Ferry Road west to New Design Road. In October 2010, access to the boat ramp was temporarily closed for consturction of a new water main for Frederick County's New Design water treatment plant, which is nearby. 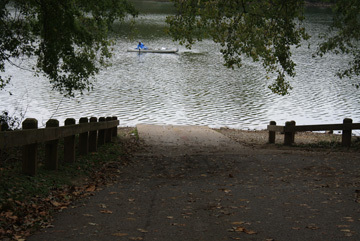 Other boat ramps in the area include the Monocacy Aqueduct Boat Ramp and the McKimmey Boat Ramp on the Virginia side across the Potomac from Point of Rocks. The old boat ramp at Point of Rocks (on the Maryland side) was closed in September 2010 as part of a project to build a new ramp.